So far it has worked for just generating a standard Code 39 barcode. I am trying to add a carriage return and a double-tab to the barcode. The font shown is not an IDAutomation barcode font and is therefore outside the scope of support. The recommendation is to use the fonts from the Code 39 Font Package, which will work as you want. James	 Please post a screenshot of the dropdown showing the font name. freyermc	 When I choose the font from the dropdown, it looks like a barcode. 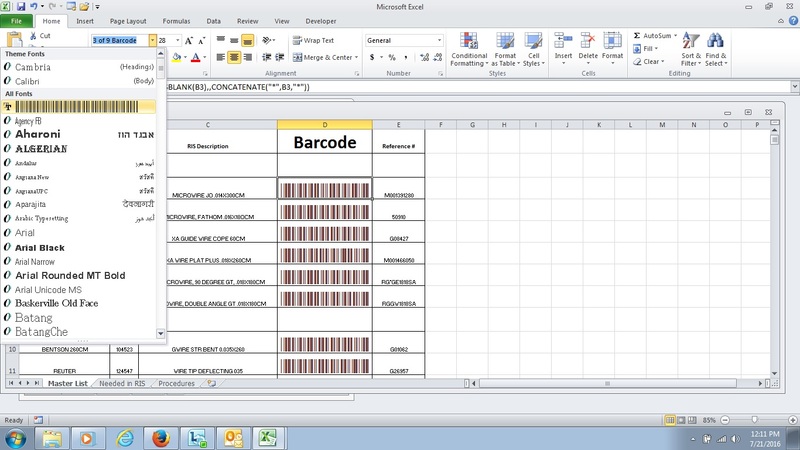 I downloaded the Barcode Addin for Word and Excel, but it does not work with the barcode. James	 Please post the exact name of the font being used. » Why is the ISBT128 ISO Mod37 calculation Wrong? » Honeywell 1902, I would like to remove any time there is a zero at the start of my barcode.